While restoring the 1940 Chris-Craft speedboat, he realized he inherited his father’s love of working with wood. So he decided to combine his design experience with his new passion and launched Not2big modern furniture (425.503.0710; not2big.com). 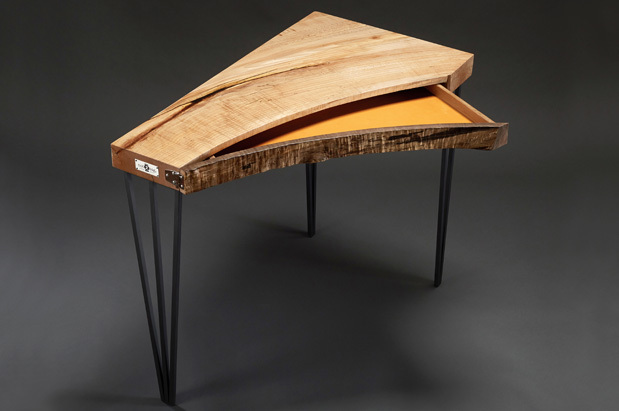 Since his inaugural sample collection in 2012, Dellplain’s pieces, such as this live edge console, have garnered design accolades, including the Northwest Woodworkers Gallery Rising Star award. The console is constructed from a single piece of curved maple. The hidden drawer (surprises are a signature of Dellplain’s work) features a nautical hinge: a nod to Dellplain’s father. Available at the William & Wayne Showroom, Seattle Design Center, Georgetown, 5701 Sixth Ave. S; 206.762.2635; williamandwayne.com.